I had a pleasant surprise when out at the Edinburgh Farmer’s Market this past Saturday, and not just that it is incredibly warm for this time of year – a flesh-baring 21C – but that I spotted a rarely seen favourite childhood food. Although I have lived in Edinburgh for many years, I actually grew up in Tennessee and Florida, two states famed for their prodigious agricultural output. Now this is going to sound odd to most of you but one thing that I have always been very fond of, and always try and eat when I visit my family, is bitter greens – collards, various types of kale, mustard and turnip greens. These grow in abundance in the southern states of America and are now well loved by many, including myself. They haven’t always enjoyed mainstream culinary attention and were for a long time eaten almost exclusively by livestock (as they are in the UK) and the African-American community. The rest of the South has gradually come to their collective senses and now greens of all kinds are a popular side dish, with even the rather grand Martha Stewart knocking up a recipe for her devotees. I just love the astringency and the way you can actually taste the minerals. They are strangely moreish in the way that the fire of really hot chillies is addictive. And I like them with loads of Louisiana Hot Sauce, so that’s two cravings for the price of one. Anyway, finding the greens was a bit of a fluke. At the Edinburgh Farmer’s Market I met the charming and knowledgeable Patricia of Phantassie Organic Vegetable Boxes. Miss R and I were just browsing and taking pictures of the gorgeously presented produce (I was coveting the woven baskets) when I spotted a sidelined sack of something strangely familiar. I asked what it was and when Patricia said turnip greens I knew I had to have some. She loaded a plastic carrier bag to overflowing with the just-picked greens, all for the princely sum of £1. At that moment I didn’t know quite what I was going to do with them, probably stir fry them with garlic and chilli and have them with pasta. But I must have been unconsciously inspired by the southern delicacy of collards stewed with a ham hock, onions and cider vinegar to come up with this recipe, because bitter greens tend to be treated in an Italian manner on this side of the Atlantic. Along with my purchases of a just-made organic ricotta cheese and a smoky-golden scamorza cheese, I couldn’t wait to get my greens home and start experimenting. Unless you grow them yourself turnip greens can be tricky to come by, but I promise, if you like things a bit nippy and naturally spicy, you will fall for this humble, deeply nutritious leaf. Other than seeing Patricia at the Edinburgh Farmer’s Market, try the cheap, cheerful and exotic shops on Argyle Place in Marchmont. 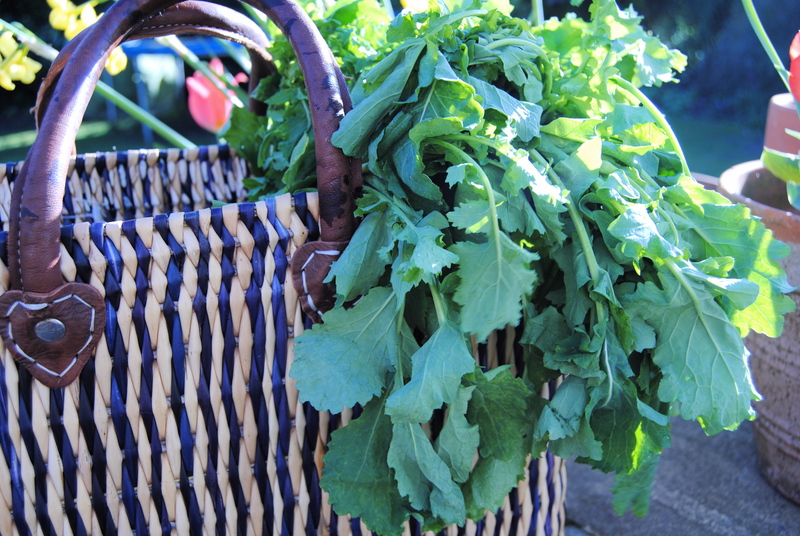 But, if you can’t or don’t want to get the turnip greens you could always use lightly wilted watercress or spinach, or even some generically named ‘spring greens’ – or a mixture of these. 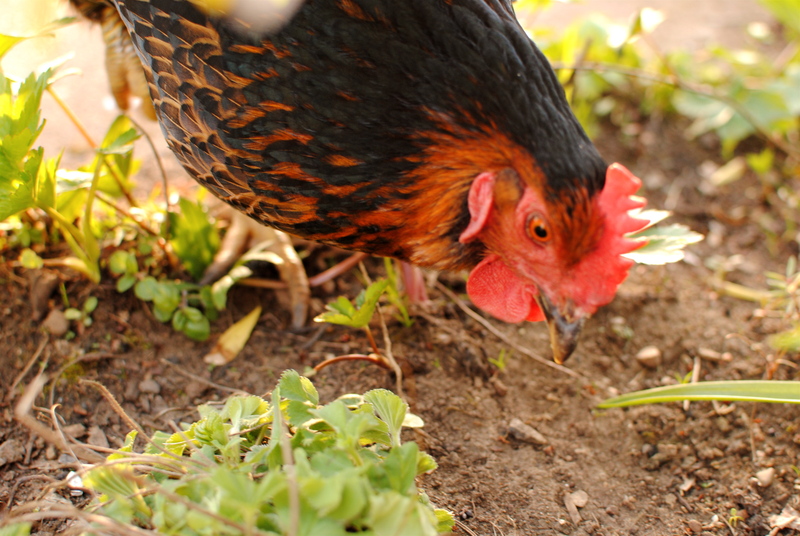 Thinking further ahead to sowing and growing your own bitter greens, the Chinese bitter leaves would be great – mizuna and choi sum spring to mind – or even some foraged purslane. Watercress, spring greens and spinach won’t have the nippiness of the turnips but they and any of the aforementioned leaves would undoubtedly be quite tasty. The advantage of using turnips is that the actual vegetable itself is beautifully sweet when picked young and small, and contrasts fantastically with the assertiveness of the garlicky stir-fried leaves. Nutrition Notes: Oh boy. Where to begin? It’s hard to believe that in this country we chuck away the most nutritious part of the turnip; the greens are veritable powerhouses of goodness. For starters they are one of our richest source of blood-clotting (in a good way) and bone-strengthening Vitamin K1 – 660% of our RDA per serving. But don’t worry about overdosing as we absorb only a fraction of this, and to absorb almost any of it we need to have it with some fat. Also, in a single ½ cup serving of cooked greens we get 150% RDA of antioxidant betacarotene, 65% of Vitamin C, 42% of our daily requirement of cancer-preventing folate, and very good amounts of calcium, iron, magnesium, B6 and of course fibre. Interestingly, it is thought that calcium gives turnip greens their unique taste; I always thought it would be the iron. What I also find surprising is that it is also one of the very few complete sources of protein, having all nine essential amino acids. The levels of each of the amino acids varies considerably making it inferior to meat as a source of usable protein, but still, it’s good to know that it counts towards our daily intake values. Turnips greens also have next to no impact on blood glucose level, so would definitely be useful for weight loss. I don’t need any excuses to eat and enjoy my greens but I’m glad they are so incredibly good for us. Most cancer nutrition specialists recommend having a daily serving of dark leafy green vegetables for their glucosinolate content, so now there is one more to add to the list of leafy choices. I hope to soon visit Patricia at her East Lothian farm. 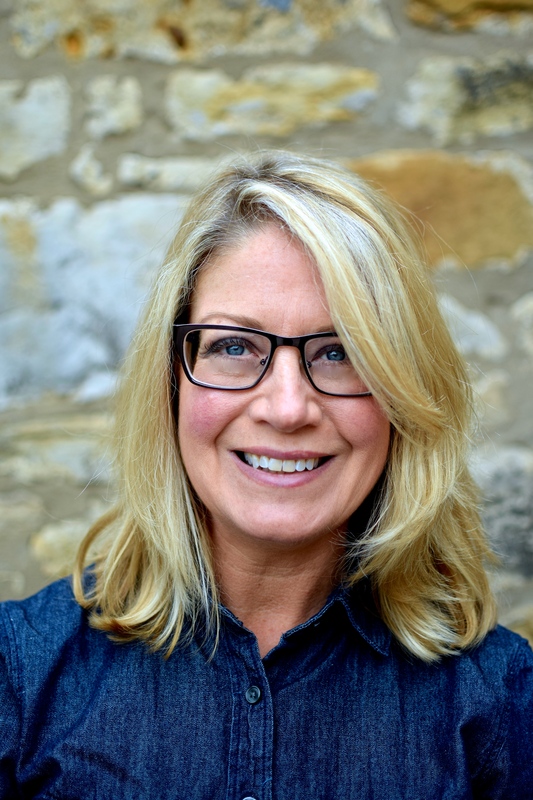 I’m looking forward to being inspired by what she has to offer and hopefully coming up with some recipes and photos that do her produce justice. Getting hungry just thinking about it. Leave out the pancetta if you must, and the smoked garlic if you can’t get it. 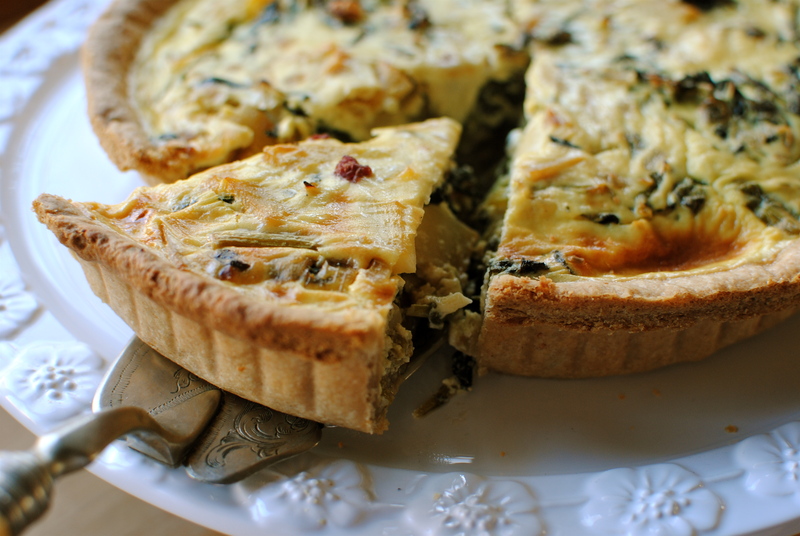 But both give the tart a twist that I think elevates the filling and the pastry. 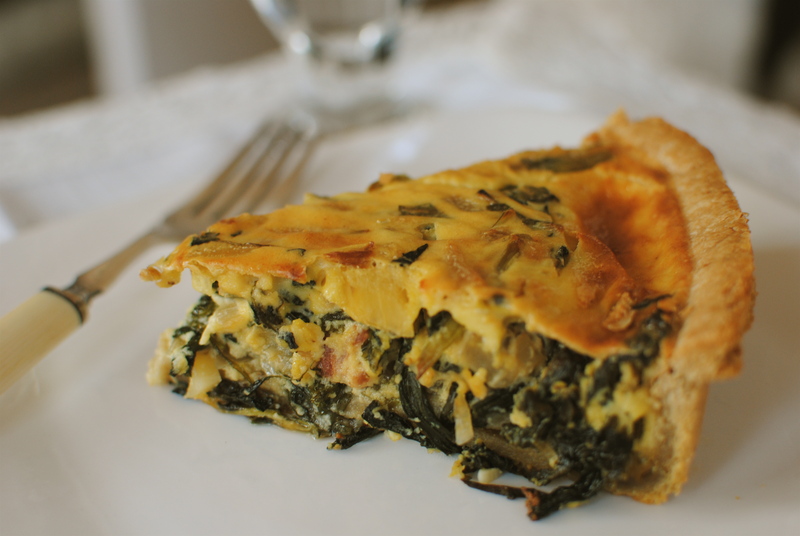 You should have smelled my house when the pastry was being ‘blind-baked’ – a savoury slice of heaven. For the pastry, put the flour, cornmeal or polenta, butter, garlic and salt in a food processor and blitz until it resembles breadcrumbs (about 10 seconds). Add the egg yolk and then pour in about two tablespoons of water – or a little more, pulsing until the mixture just comes together as a dough (about 10 seconds). Take it out of the processor and knead it lightly for a minute before wrapping in clingfilm and refrigerating for ½ to one hour. If you don’t have a food processor or free-standing mixer combine the dry ingredients (mincing the garlic first) in a large bowl before adding the egg and water to bind. 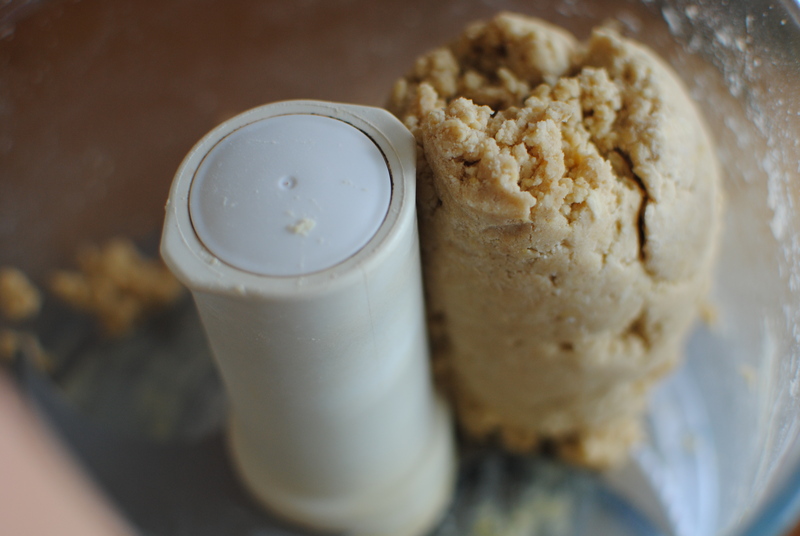 On a lightly floured work surface roll out the pastry to a thickness of about 2 mm (e.g. quite thinly) and then drape it into a 25-28 cm loose-based tart tin, gently pressing the dough into the tin; let the excess hang over the edge to allow for shrinkage in the oven. Get some greaseproof/parchment paper, scrunch it up to soften and shape it into the pastry, fill with ceramic baking beans or dried beans/rice and bake blind (strange term) for 20 minutes at 170C/340F. Remove the baking beans and paper, prick the case with a fork and return to the oven for five minutes. Sometimes I heat a baking tray first and put the baking tin on it but it works fine without it too. 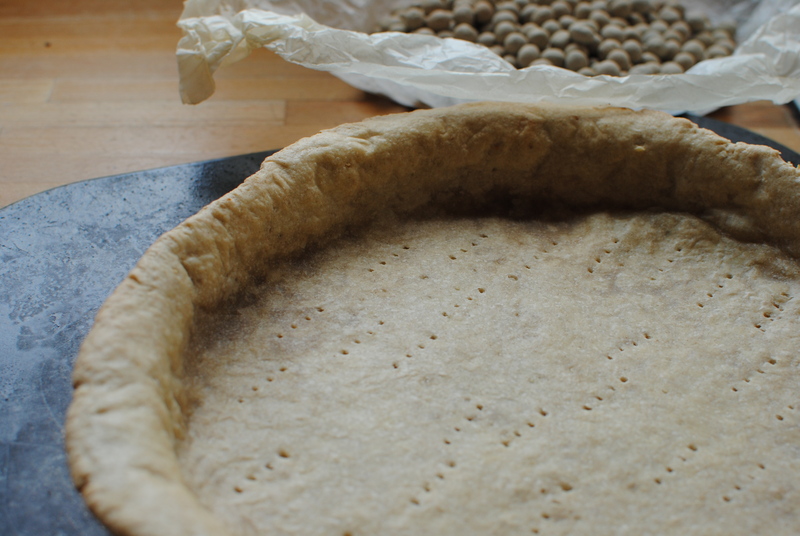 Remove the tart case from the oven and carefully trim away the excess pastry with a short, sharp knife. Keep the oven on but turn it to 180C/350F, and add/keep in the baking tray. 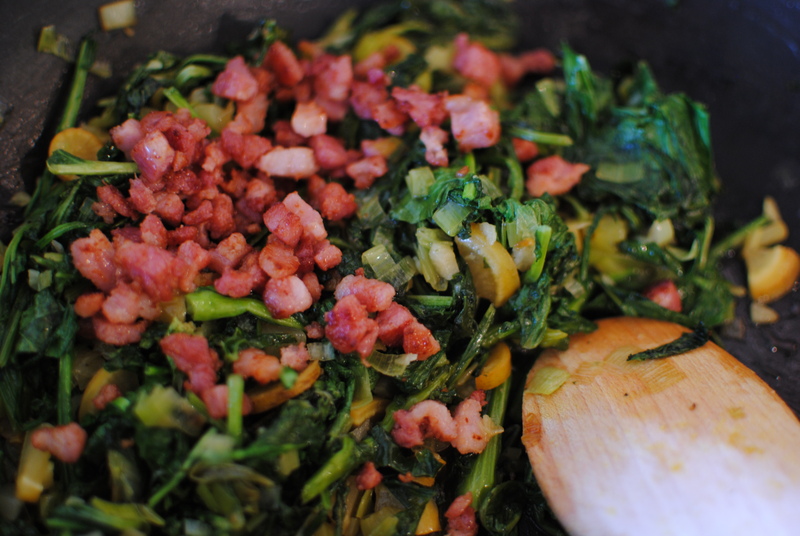 For the filling, heat a wok or large sauté pan and fry the pancetta in its own fat until it starts to crisp a little. Remove the porky pieces with a slotted spoon, set aside and drain off the fat. Pour in the olive oil and add the leeks/onion, garlic and chopped greens. Stir fry on a medium heat for a few minutes before adding the stock and covering. Let the vegetables cook for about 10 minutes, stirring occasionally until the liquid is mostly absorbed and the greens are tender. If you are using spinach or watercress saute the onion and garlic for five minutes before adding the greens and sauteeing for a further five minutes. Drain in a fine sieve, pressing the vegetables and reserving the cooking juices. 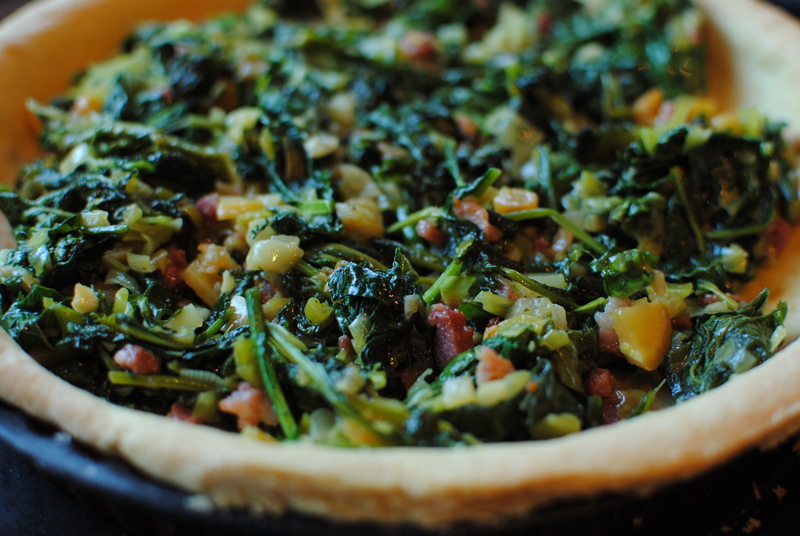 Add the vegetables and the fried pancetta to the cooked tart case. Beat the crème fraiche or cream with the eggs and cooking juices, seasoning with black pepper and a little salt or dried vegetable stock powder (I do the latter – Marigold Swiss Vegetable Bouillon). Pour this over the vegetables and disturb it a little with a fork to make sure it seeps in evenly. Pop the tart onto the hot baking tray and bake for about 30 minutes, or until the tart is set – doesn’t wobble in the middle when lightly shaken. Allow to cool to just above room temperature before serving. Tastes delicious cold too. Serves 6-8 P.S. Please forgive the lack of paragraphs – something’s wrong with the editing functions. Hope it’s not too annoying. I absolutely love bitter greens. I haven’t tried mustard, usually kale, collards and chard. This tart looks absolutely delicious. Thanks Cassie. I’m glad someone else is a bitter greens fan as well! Turnips are almost finished here but I will be making it again with young choi sum leaves as they have a similar taste to turnip greens. Thank you so much for this recipe! I just got a CSA share, and my singing teacher gave me some farm fresh bitter greens…and I want to do something besides sautee them. I will be making this recipe today. I’m glad you think this recipe could do justice to your CSA greens. Bitter greens are also gorgeous with gnocchi (I have a post with kale & butternut squash with chili & lemon zest etc – a family fave). Enjoy!